On the heels of Donald Trump’s controversial executive order on immigration and refugees and a weekend filled with confusion and airport delays as travelers tried to make it back into the country, the head of the African Union has criticized the widely condemned ban on immigration from some Muslim-majority countries, saying that it presents “one of the greatest challenges” for the continent. 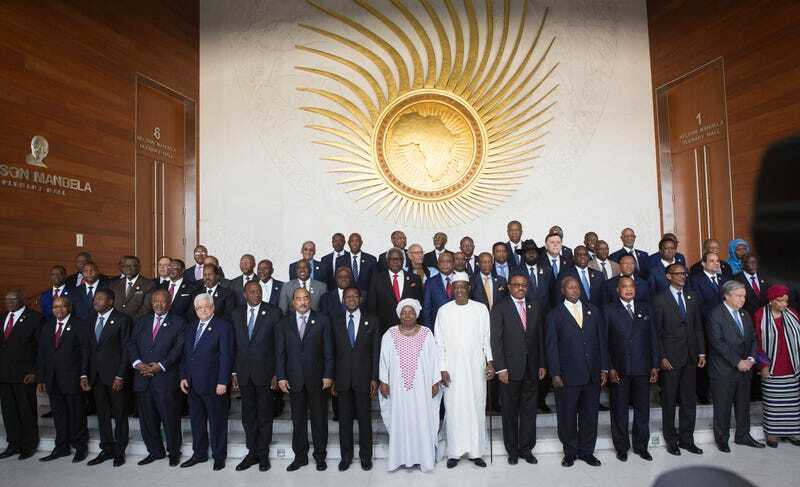 The Independent reports that representatives of the African Union’s 53 member states met in Addis Ababa, Ethiopia, for a two-day summit, and the chief of its commission said the bloc was entering “very turbulent times” after Trump’s election. As previously reported on The Root, exactly one week after being sworn in as president of the United States, a country founded by refugees escaping a tyrant in their home country, Donald Trump issued an executive order Friday indefinitely banning Syrian refugees and temporarily suspending Muslims from seven countries from entering the country. As part of the order, the ban prevents people from the African countries of Libya, Somalia and Sudan from traveling to the U.S. Attending the AU summit for the first time in his capacity as United Nations secretary-general, Antonio Guterres commended African countries for opening their borders to refugees and people fleeing violence. While he did not make a direct reference to Trump’s executive order, the message was very clear.